This guide will show you the quickest and easiest way to dual boot Windows 8.1 or Windows 10 with Linux Mint 18. Linux Mint has been the most popular version of Linux on the Distrowatch website for a number of years and according to its own website, Linux Mint is the 4th most popular operating system on the planet. 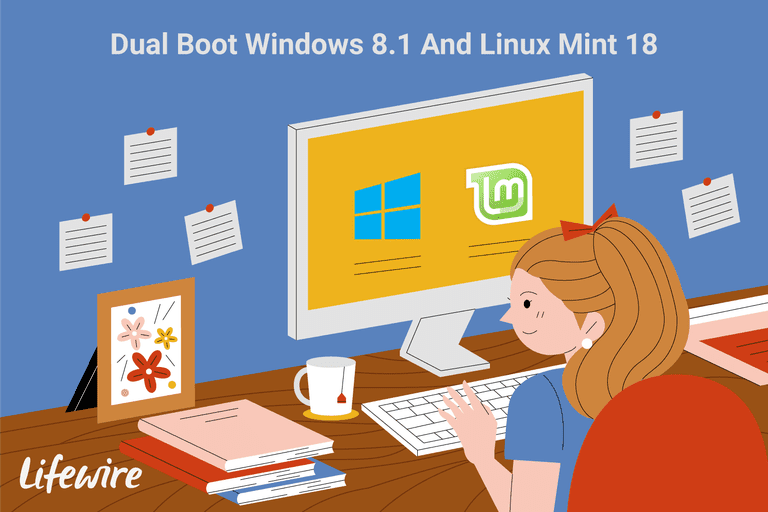 This guide provides you everything you need to help you to dual boot Linux Mint 18 with Windows 8 or Windows 10. Before you start there is a key step that you must follow which is to back up your computer. Click here for a guide showing how to backup your computer. Windows 8.1 and Windows 10 take up a large amount of space on your hard drive although most of it will be unused. You can use some of the unused space to install Linux Mint but to do so you have to shrink your Windows partition. Check here to learn how to create a Linux Mint USB drive. It will also show you how to setup Windows 8 and Windows 10 to allow booting from a USB drive. The Linux Mint installer no longer asks you to connect to the internet as part of the installer. There are steps within the installer for downloading and installing third party packages and installing updates. To connect to the internet look in the bottom right corner for the network icon. Click on the icon and a list of wireless networks should appear. Choose the network you wish to connect to and enter the password for the wireless network. If you are using an ethernet cable then you will not need to do this as you should automatically be connected to the internet. To start the installer click the "Install" icon from the live Linux Mint desktop. The first real step is to choose your language. Unless you feel like a challenge choose your native language and click "continue". You will be asked whether you want to install third party software. The third party software allows you to play MP3 audio, watch DVDs and you will get common fonts such as Arial and Verdana. Previously this was included automatically as part of the Linux Mint installation unless you downloaded a non-codec version of the ISO image. However in order to reduce the number of ISOs produced this is now an installation option. I recommend checking the box. Choose the first option to install Linux Mint 18 alongside your version of Windows. If you want to make Linux Mint the only operating system choose the 2nd option. This will wipe your entire hard drive. In some cases, you might not see the option to install Linux Mint alongside Windows. If this is the case for you follow step 5b below otherwise move on to step 6. If you had to choose the something else option then you will need to create the Linux Mint partitions manually. A list of partitions will appear. Click on the words "Free Space" and click the plus icon to create a partition. When the "Create Partition" window opens enter a number which is 8000 megabytes less than the total free space available in the "size" box. Select "primary" as the "partition type" and set "use as" to "EXT4" and "/" as the "mount point". Click "OK". This will create the root partition. Finally, click on the "Free Space" and the plus icon again to open the "Create Partition" window. Leave the value specified as it is (it should be around the 8000 mark) as the disk space, select "primary" as the "partition type" and set "use as" to "swap". Click "OK". This will create the swap partition. (All of these numbers are for guide purposes only. The root partition can be as little as 10 gigabytes and you don't actually need the swap partition if you don't want to use one). Make sure the "Device for bootloader installation" is set to the device with the "type" set to "EFI". This is the point of no return. Make sure you are happy to continue before clicking "Install Now"
Whilst the files are copied across to your system you have to complete a few more steps in order to set up Linux Mint. The first of these is to choose your timezone. Simply click your location on the map and then click "Continue". This step is important because if you don't get this right, symbols on the screen will appear to be different to the ones printed on your keyboard keys. (For instance, your " sign may come out as a # symbol). Choose your keyboard's language in the left pane and then choose the correct layout in the right pane. To be able to login to Linux Mint the first time you will need to create a default user. Enter your name into the box provided and then give your computer a name that you will recognize. (This is useful if you try to connect to shared folders from another computer and to identify it on a network). Pick a username and enter a password to be associated with the user. (You will need to confirm the password). If you are the only user of the computer then you might want the computer to login automatically without having to enter the password otherwise click the option to require you to log in. I advise leaving this as the default option. You can choose to encrypt your home folder if you so wish. (I will be writing a guide shortly as to why you would want to do this). Linux Mint will continue to copy all of the files across to the partition you dedicated to it and the installation will eventually complete. The amount of time it takes for Linux Mint to install depends on how quickly it can download updates. When the installation has finished, click the "Restart Now" button and when the computer begins to reboot remove the USB drive. Choose "Linux Mint" to try it out for the first time and make sure everything boots properly. Now reboot and choose the "Windows Boot Manager" option to make sure Windows loads correctly. Click the link if your computer boots straight to Windows.